June 3 – 7 from 9 a.m. to noon. Are you ready to ROAR? This epic African adventure engages the whole herd. 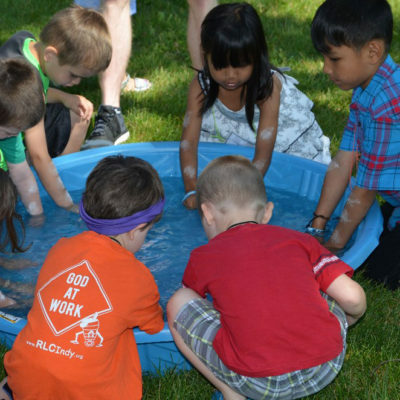 At ROAR VBS, kids explore God’s goodness and celebrate a ferocious faith that powers them through this wild life. Team-building games, cool Bible songs and tasty treats are just a few of the standout activities on this ROAR of a good time! Plus, we’ll help kids discover how to see evidence of God in everyday life – something we call God Sightings. 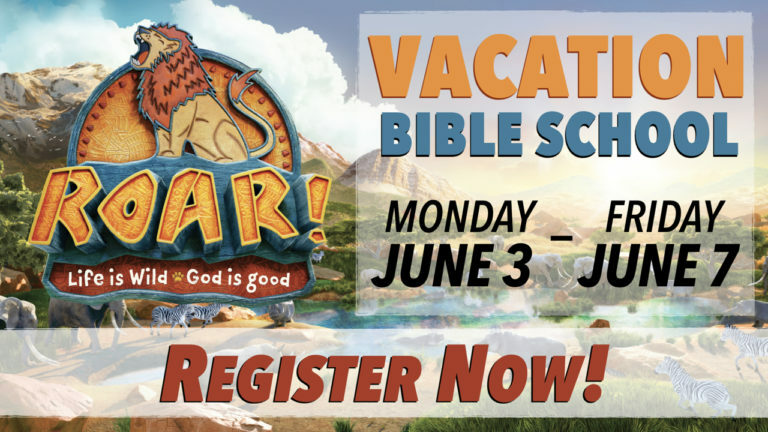 VBS participants are children who are 3-years-old by August 1, 2018 through those who are completing 5th grade. Your child will join a “family-group” of 5-7 kids with 2 Crew Leaders for the week. The “family-groups” will rotate from station to station learning about Jesus’ love and how we can share His love with others beyond the four walls of the church building. We do not charge for VBS, but accept donations to help defray the cost. Requests to be with other participants are strongly considered, but not guaranteed. New for 2019: We are not making t-shirts during the week of VBS, but if you register on or before Sunday, May 12, you will receive a custom VBS t-shirt! Please be sure to indicate your size on the registration form. We need lots of hands throughout the week. Station Leaders are the core of our ROAR VBS! These are the people who prepare and teach the material in the station leader manuals, as they show God’s love to the kids who participate. If you consider yourself a mature adult or older teenager, dependable RLC disciple, enthusiastic about working with children, excited about serving at ROAR VBS, patient and kind, good communicator, comfortable speaking in front of groups of 30 and gifted in a specific station area – then herd on over and be a station leader at ROAR VBS! Crew Leaders are an important part of the week of VBS helping a small group of mixed elementary ages move from station to station engaging in conversation! Crew Leaders do not need to prepare anything, just come each day, guide the crew members through activities, help facilitate discussions, and generally join in the VBS fun! A Crew Leader is a friend and a helper, responsible for drawing kids into discussion, someone who offers kids choices, someone who asks questions, someone who encourages kids, and someone who helps and encourages Station Leaders. Crew Leaders can be students who have completed the 5th grade. We can always use a set of hands to hang out with the youngest in the nursery whose parent is helping with VBS. Questions about VBS at Resurrection can be directed to Trisha Thompson or the parish office at parishadmin@rlcindy.org or (317) 881-7854.